The 2015 Triple Crown horse racing season comes to a close this Saturday with the running of the Grade 1 Belmont Stakes at Belmont Park in Elmont, New York. 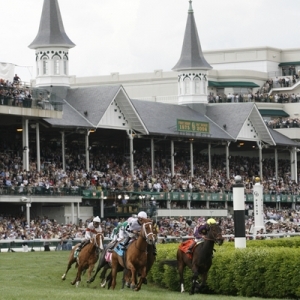 All the buzz surrounding this year's event involves American Pharoah's bid to become the first Triple Crown winner since 1978 after posting impressive victories in both the Kentucky Derby and the Preakness Stakes. While bettors will be dialed into American Pharoah as a heavy favorite to win Saturday's Belmont Stakes, there are also some great opportunities to cash in on this potentially historic event through a few of the prop bet odds for head-to-head matchups between some of the other contenders in Saturday's eight-horse field. Going over the storied history of this horse racing series for three-year-old thoroughbreds, there have been only 11 Triple Crown winners. The last was Affirmed in 1978, and since that point horse racing fans have watched 13 other horses come up short in the grueling 1 ½-mile Belmont Stakes after winning the first two jewels of this elusive crown. While past trends are definitely not in American Pharoah's favor to join this elite group, Bovada's prop bet odds are. This champion three-year-old is listed as a -140 favorite to win the Triple Crown against the even-money +100 odds that one of the other seven horses in Saturday's field pulls off the upset. Don't get me wrong, winning this race would still be a tremendous accomplishment for this colt, but the field he is facing in Saturday's race is not the strongest. Carpe Diem was thought to have a good chance to contend in the Belmont Stakes, but he was a late scratch. Both Firing Line and Dortmund battled American Pharoah in the first two races, but they remain on the shelf for the Belmont. The next best betting odds for a horse that is in Saturday's field are 5/1 for Frosted, who finished fourth in the Kentucky Derby, well in back of the winner. History may not be on American Pharoah's side, but the betting odds are as my pick in this prop. Sportsbook.ag has set the prop bet odds for this head-to-head matchup at -115 for either of these two horses, but I am going with Materiality as my pick to finish higher than Frosted. I actually have him as my "place" horse in this race as a 13/2 third-favorite. He is one of trainer Todd Pletcher's two entries in Saturday's Belmont, and he could very well benefit from Carpe Diem's scratch. Materiality won the Grade 1 Florida Derby at Gulfstream on March 28 with jockey John Velazquez aboard for the ride. Velazquez was committed to riding Carpe Diem in the Kentucky Derby, so Javier Castellano got the call in that race. The results were considered strong with Materiality finishing sixth at Churchill after going off from the third post at 12/1 odds. Frosted is still a solid horse with that fourth-place finish in the Derby on his resume, but the thing I like the most about this matchup is the fact that Velazquez is a two-time winner in the Belmont Stakes. Moving down the list of betting odds for Saturday's race, Frammento currently stands at 33/1 odds to win, while the odds on Keen Ice are listed at 25/1. As far as a head-to-head matchup between the two, the moneyline odds favor Keen Ice at -150 verses betting odds of +120 for Frammento. The reason I am going with the higher moneyline risk on Keen Ice in this prop is that I actually think this three-year-old can finish in the money at Belmont as my show horse. All the early reports on his recent workouts leading up to Saturday's race have been positive. He is trained by Dale Romans and ridden by Kent Desormeaux. In the Kentucky Derby, this colt made his way to seventh in a crowded field of 18 after going off from the 14th post at 50/1 odds. Trained by Nick Zito, Frammento went off from the far outside post in the Derby at 50/1 odds and placed 11th with Corey Nakatani as his jockey. Wow! Free Belmont Stakes picks. And it could not be easier. Follow the link and sign up (no credit card required, and no salesperson ever), and you can have your free Belmont Stakes picks in minutes. Click here for the no-hassle sign up.